← 2E. Military TXA Studies – TXA looks good in multiple settings. Take Home: TXA works in an established trauma system. They also gathered information on “shock” defined as an ABG showing a base deficit of > 6 mEq/L. Comparison: Patients who did NOT get TXA – this group was very different than the TXA group. Outcomes: Mortality, Multi-organ system failure, Infection, VTE, and Stroke/MI amongst other outcomes. Results: 160 patients got TXA, 225 did not. TXA patients were much sicker, which made analysis difficult. 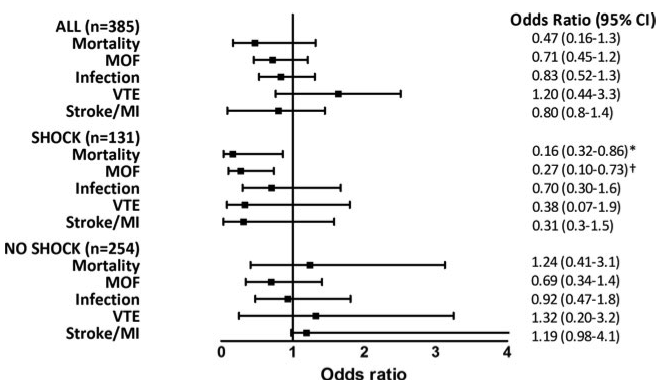 Multivariate analysis showed: TXA improved Mortality and Multiorgan Failure in Hypotensive patients only, with no effect in normotensive patients. Conclusion: This is a smaller study that seems to show effect mostly in patients with shock, though how they got there and their measurement of shock as a base excess is a bit unusual. This entry was posted in Trauma and tagged Tranexamic Acid, Trauma, TXA. Bookmark the permalink.